Lemon & Ginger - A Ginger Herbal Infusion with Lemon Flavour. Ginger - A Ginger Herbal Infusion. Lime & Ginger - A Ginger Herbal Infusion with Lime Flavour. Ginger & Rhubarb - A Ginger Herbal Infusion with Rhubarb Flavour. With your support, Twinings help provide access to clean water to villages across Darjeeling. Help improve mother and baby health in tea growing regions of Yunnan. And help improve health and nutrition in tea communities in Assam. To learn more about these projects while you finish your cup head to twinings.co.uk. 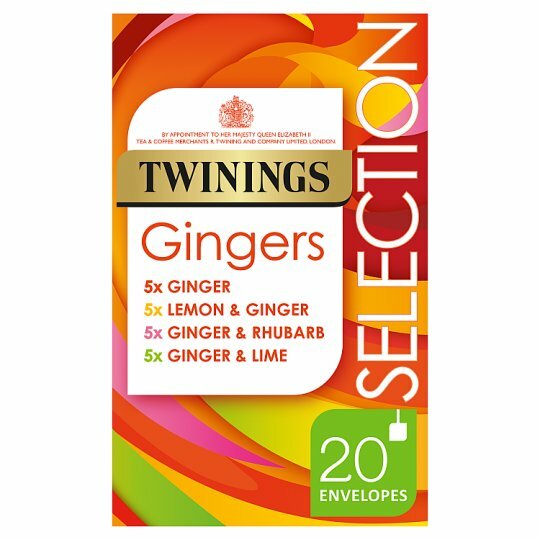 If ginger is your favourite, this selection pack is the perfect way to discover the best this fiery, warming flavour has to offer. A delicious array of our four favourite Ginger infusions; the classic Lemon & Ginger, fiery Ginger, Zesty Lime & Ginger and warming Ginger & Rhubarb. Boil fresh water and pour over the teabag. Infuse for 2 to 3 minutes. The quick way: Give the tealine a ring on 01264 313444, weekdays from 8am to 6pm. The easy way: Pop along to twinings.co.uk. Ginger*, Lime & Ginger* and Ginger & Rhubarb* *Contains liquorice - people suffering from hypertension should avoid excessive consumption.